The OJLMG is a book that provides information on everything you need to know to start and run a successful lawn mowing service. This book is written for a target audience of young people aged 12-18. With the help of my New Venture Management class at CSU, I have set the price for the paperback version at $11.95. The eBook version is set at $8.95. These prices were also set through a market-based pricing strategy by comparing the OJLMG to other books with similar content. The OJLMG is available to purchase online at JuniorBiz.com, Amazon.com and CreateSpace.com. I have also managed to get into my first bookstore (Reader’s Cove in Fort Collins, CO) as well as a dental office (Jennifer Scheidies DDS in Longmont, CO). Last week I met and talked with Charles Kaine, owner of Reader’s Cove, and he gave me some great ideas on ways I can promote my book. In the coming weeks I’ll be leveraging my status as a student to write and distribute press releases to a number of local periodicals and newspapers. Ben Foster, owner of TeenLawnCare.com, was also kind enough to review the OJLMG on his site and promote it through his email subscriber list. The second objective was to increase traffic to JuniorBiz.com. Throughout the semester I have been building links to my site by posting comments on influential blogs. Last week I left comments after articles on Forbes.com (Alexa Rank #456) and BusinessInsider.com (#4,436). Collectively these links have brought 2 visitors to JuniorBiz.com but these types of links are intended more for Google Spiders; which will eventually increase my Page Rank. The third objective of the Project Charter was to boost JuniorBiz.com’s social media presence. Over the lifetime of my site (since August 2008) Twitter.com has contributed 9.47% of my traffic. Since opening a Twitter account in December 2008, 11.28% of my visitors came from Twitter. Keep these stats in mind as I walk you through my Twitter Experiment with the Automatic Direct Message function. This message was enabled for 2 weeks and was sent to 207 people. In the first week, JuniorBiz.com had 28 visitors (23.53% of the traffic for the week) from Twitter, but it’s impossible to tell how many came as a result of the direct message. During the second week, I had 63 visitors (33.69%). Then last week after I disabled the direct message, I only had 25 visitors (16.23%) from Twitter.com. CoolAlDuncan @JuniorBiz No problem. I’m feelin’ what you do and I will definitely be supporting. Looking forward to your blog posts. LDsBoutique @JuniorBiz Hey NICK! Umm about a year now. Just getting started good! Your site is really NEAT too, good idea! Tommyoroguestar – I would say content that is focused on businesses that a 20something could run…for example I run an online marketing business, others run video production companies and some do computer repair…you get the idea…the principals are still the same as running the lemonade stand and the lawn mowing companies so it’s a strong root for whatever direction you take it. email? ReyesMike – Nick, how wud u like 2 be part of my Evaluation Team for a Youth Startup Challenge? You cud be online to get this done. let me know. Talentdiva – Nice blog. You should connect w/my son @hireateen (he also has @mysittersclub as his business). 1 thing, don’t use the DM too much because ppl will see it as spam. Just sending “hey look @ my link” messages can backfire. 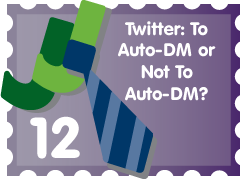 So… To auto-DM or not to auto-DM? Generally, automatic direct messaging is a bad idea. Adrienne (aka Talentdiva) makes a good point about the auto-DM being used to spam. People use Twitter to connect with other people, not with robots. Another thing to consider is that I have received two substantial “rewards” through this experiment. Mike (aka ReyesMike) has offered me the opportunity to judge for a Southeast Asian Youth Business Plan program, and I have seized it! Also, Tommy (aka Tommyoroguestar) has offered to write for JuniorBiz.com. I checked out his SEO blog and he’s a great writer as well as a young entrepreneur. I’m looking forward to reading and posting his articles. Do I regret utilizing the auto-DM? Absolutely not. When used properly, it is incredibly effective at drawing traffic, encouraging feedback and building relationships. But again, if you set up the auto-DM, make sure you follow through with everyone who participates; which is hard to do and takes quite a bit of time. Final Answer: Yes, if you are devoted to using it properly and want to meet new people. No, if you’re too busy and only want to use it to draw 1-time visitors who will likely unfollow you if you don’t live up to your promise. I have combined the last 2 objectives because they are boring in comparison to Objective 3. However, I met with Annette Paetzel from Junior Achievement this last week and I will be teaching a youth entrepreneurship course to local middle school students this summer. I came into contact with Annette through Lucinda Kerchensteiner; who knew me through the Northern Colorado Entrepreneurs Network. Twitter is great but don’t underestimate the power of local networking as well..